Many thanks to Kevin for passing on the picture above of his Father, Reg Smith, Rear Gunner with Maurice Adamson’s crew, who flew in the Squadron towards the end of the War in 1945. Kevin donated his Father’s logbook to the blog almost exactly 2 years ago and with the arrival of these 2 new pictures, I thought it was worth re-presenting the crew with a full Op history, something, that originally with the blog, I didn’t tend to do when a logbook was added to the collection. The Adamson crew flew a total of 21 ops before the end of the war and continued to fly a food drop on The Hague, repatriate Prisoners of War from Juvincourt and fly a number of observation trips over Germany to view the effects of the bombing campaign by the Allies. Interestingly Reg’s logbook also covers the break-up of the Squadron – whilst his Commonwealth crew mates moved with 75(NZ) to Spilsby in preparation for Tiger Force, Reg stayed at Mepal and joined 44 Squadron. The Adamson crew arrived at Mepal on the 19th of January 1945 from 1653 Conversion Unit. Probably, as Wing Commander, without his crew, Mac Baigent took the whole crew up for their first Op on the 9th of February to Hohenbudburg. Twenty one aircraft were detailed to attack Lutskendorf, but the target was changed during the afternoon to Hohenbudberg. This operation was carried out in 8/10th cloud with tops about 10,000. Flak was slight to moderate and S/L effective. A scattered raid was reported. F/O M. Adamson, RNZAF NZ426904 – 2nd Pilot. F/S Kenneth William Rathbride Mitchell, RNZAF NZ425700 – Air Bomber. Sgt. 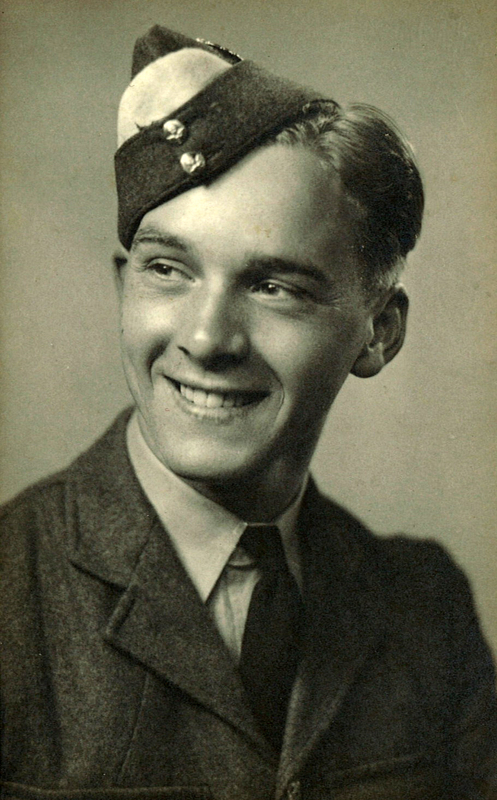 John Palmer, RAFVR – Flight Engineer. Sgt. Reginald Arthur Smith, RAFVR 1606544 – Mid Upper Gunner. Sgt. Frank Rhodes, RAFVR – Rear Gunner. Twenty one aircraft were detailed to attack Osterfeld, carrying 4000 HC 500 ANM 250 GP bombs, JN”O” F/L Jones, K. returned early through engine failure. There was no cloud over the target, but some haze. Crews found it difficult to identify the target visually owing to smoke and difficult formation flying conditions in flak, but the impression is that the concentration of bombing was excellent and the target well “pranged”. Flak was moderate to intense and several aircraft were damaged. Eighteen aircraft were detailed to attack Gelsenkirchen, carrying 4000 HC 500 ANM 500 MC bombs. NZ426904 F/O M.Adamson and NZ425292 F/L D.Sadgrove returned early through engine trouble. Cloud was ten tenths. Leaders met slight to moderate H/F. No results were seen. Seventeen aircraft were detailed to attack Kamen, carrying 4,000 H.C., 500ANM., 500 M.C. and Munro bombs. F/O D. Barr in AA”C” jettisoned and returned early through engine trouble. Crews bombed on special equipment as the target was obscured by ten tenth cloud. Flak was negligible. F/S John Palmer, RAFVR – Flight Engineer. Twenty aircraft were detailed to attack Cologne. No aircraft bombed owing to special equipment failiure. Three aircraft jettisoned due to flak damage to engines, the remainder bringing their bombs back. F/O Woodcock was wounded in the neck and his engineer F/Sgt. Gibb in the legs but landed safely at base. Twenty one aircraft were detailed to attack Gelsenkirchen. AA”E” F/S Lukins was withdrawn. AA”W” F/L Parker and JN”X” P/O Cleminson returned early through engine trouble. The remainder found the target obscured by 10/10ths cloud tops 15,000 ft. Aircraft bombed on special special equipment. Leaders had a good run in and there was a good concentration at this time. Aircraft were met by slight H/F on outward route. No fighters were seen. Sixteen aircraft attacked Salzbergen in 10/10ths cloud up to 11,000ft. with nil clouds below. The formation was well packed over the target and released simultaneously. A slight upheaval of the cloud a minute later was all that could be seen. Slight H/F was the only opposition. Nineteen aircraft took off to attack the Auguste Viktoria Benzol Oil plant. Cloud and vapour trails limited visibility to 50yds over the target, but the aircraft remained in light formation and bombs were released together. No results were seen. Opposition was slight H./F. P/O Maurice James Adamson, RNZAF NZ426904 – Pilot. Sgt Reginald Arthur Smith, RAFVR 1606544 – Rear Gunner. Eight aircraft were detailed to attack Wesel carrying 1,000 M65 (RT), 1,000 M65 (B.T.) and Munro bombs. The target was attacked with the aid of special equipment. There was no cloud over the target but the visibility was poor owing to smoke. All crews reported a good concentration of bombs on the A/P. Very slight H/F was experienced. Twenty one aircraft attacked Saltzgitter as detailed. Cloud was ten tenths, tops up to 19,000 ft and thin cloud and contrails persisting above, reducing visibility to 500yds. No results were observed and a scattered raid is reported. Flak moderate. 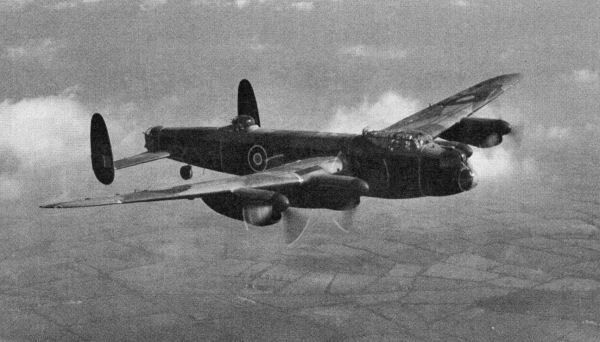 21 aircraft were detailed to attack Keil, carrying 4,000 HCN, 1000 ANM, 500 ANM and Munro Bombs. The target was covered by 10/10 cloud and tops 4/5000. Bombing was concentrated and fires were seen on leaving target. Flak was Slight. This was also a leaflet raid. F/L Maurice James Adamson, RNZAF NZ426904 – Pilot. 10 Aircraft were detailed for repatriation of Prisoners of War. The number of men brought back was 240. S/Ldr. B. Mckenna (AA.J) crashed when taking off at Dunsfold for Baso. There were no injuries and the crew returned with F/Lt. M. Adamson (AA.K). Complaints were made of the bad landing procedure at Dunsfold. F/O Tulley R, RAFVR 1606544 – Rear Gunner. 2 Aircraft were detailed for flights over the continent to see the effects of the bombing offensive. 5 aircraft were detailed for viewing the effect of the Bombing Offensive. 12 aircraft were detailed for the Post Mortem Operations for checking Gernam Radar Equipment. 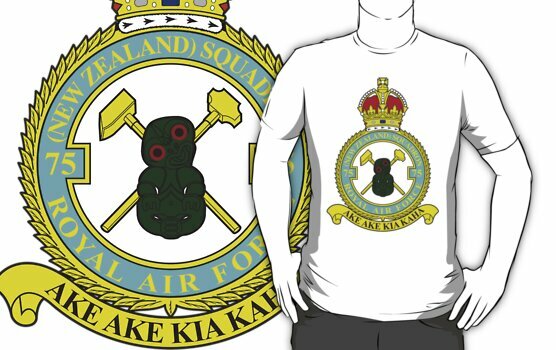 F/O Kenneth William Rathbride Mitchell, RNZAF NZ425700 – Air Bomber . Sgt. 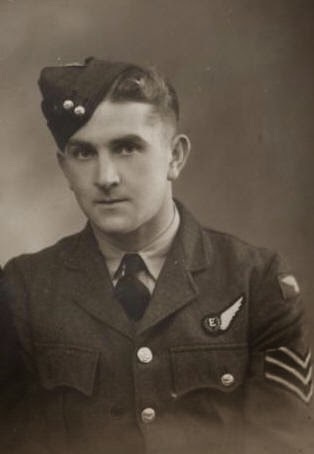 Frank Rhodes, RAFVR – Mid Upper Gunner . 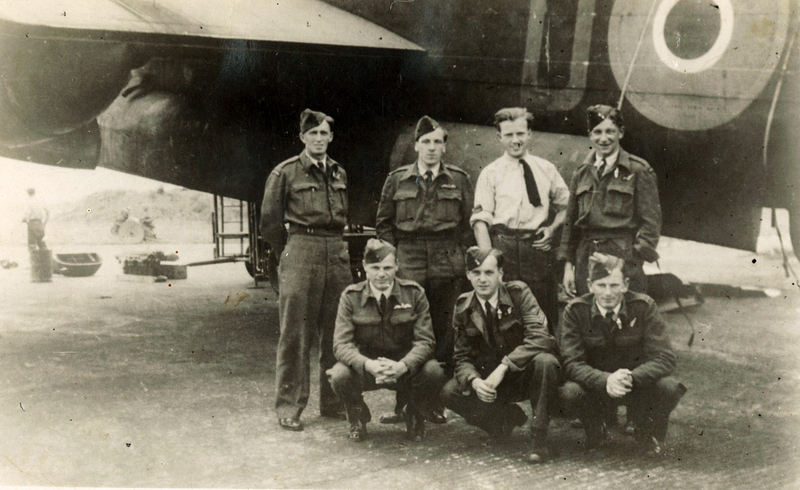 This entry was posted in general and tagged 1944, 1945, 75(NZ) Squadron RAF, Arthur Edwin Noel Unwin, Aviation, Bomber Command, Frank Rhodes, John Palmer, John William Fisher, Kenneth William Rathbride Mitchell, LM544 AA-D, LM740 AA-B, Maurice James Adamson, ME531 AA-K, Mepal, NF741 AA-D, NG448 AA-A, NN747 AA-D, NN773? AA-G, PB418 AA-C, PB741 AA-E, PB763 AA-A, RA541 AA-J, Reginald Arthur Smith, RF190 AA-F, Tulley R, World War 2 on March 22, 2015 by 75nzsquadron. Look again David , Monty is front on the left.. Al.